Charles Martin, Capital City Health Center director of behavior health, has both professional and personal viewpoints regarding the challenges of diabetes. His parents and grandparents were insulin-dependent and he is recovering from a diabetes-related limb amputation. Even when the challenges seem great, Martin invokes the daily prescription of NFL coach Chip Kelly: Win the day. This deadly opponent packs a daunting record against Black Americans who are greatly disproportionately affected by diabetes. More than 13 percent of all Black Americans above the age of 20 are living with diabetes. In addition, Blacks are 1.7 times more likely to have diabetes as non-Hispanic whites. Diabetes is one disease that can spawn serious complications or makes a person susceptible to related conditions. 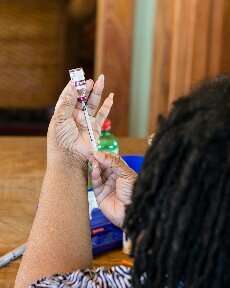 African-Americans are significantly more likely to suffer from the diabetes complications of blindness, kidney disease and amputations. Specific – I will decrease my average fasting blood sugar by 2 points each week. Attainable – Is the goal attainable for me? Your diabetes care team should be consulted about ways to reduce your A1C and risk of complications. Realistic – Is the goal realistic for me? Lowering one’s blood sugar is a great goal, but drastic drops can increase changes of hyperglycemia. Timely – I will make an appointment with my care team every three months in 2016 to evaluate my A1C with hopes to start 2017 near 7.5.